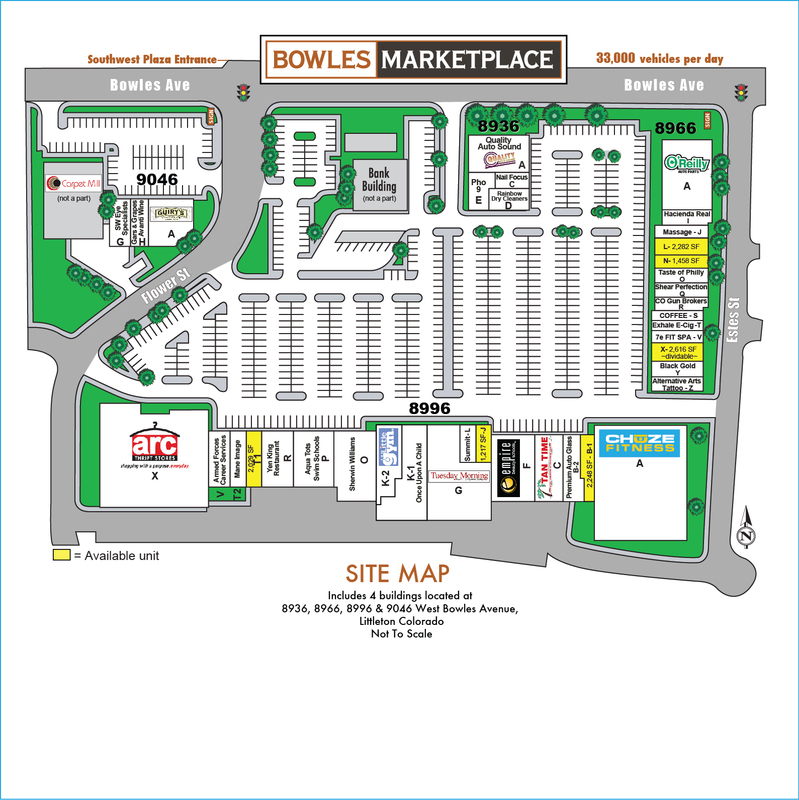 Come join our great mix of local & national tenants that call Bowles Marketplace home. High traffic center with ample parking and excellent visibility from Bowles Avenue. Convenient location across from Southwest Plaza and near the busiest intersection in the metro area: Bowles Ave. and Wadsworth. Great tenant mix and accessible owners who work with you to succeed! Free advertising on this website is available to all Bowles Marketplace businesses! Ability to participate on our new Electronic Signage section of the 2 main monuments for even greater exposure. Ask for details! This space currently has a great layout for medical, office or other retail. Build to suit or walk into a ready-made office/medical/classroom setting. Combine contiguous space for up to 3,740sf. Conveniently located between Little Yen King Restaurant & Mane Image Salon, offers great traffic from our other larger tenant mix: ARC Thrift Store, Kwal Paint, Little Gym, Aqua Tots, Tuesday Morning, CHUZE Fitness, and more. This great location is right next door to our NEW Fitness company: CHUZE Fitness. Retail in line space is a nice location next to busy Taste of Philly. Combine contiguous space for up to 3,740sf. Call for details. One of our larger spaces available at Bowles Marketplace. Unit X has a lot of options for new buildout and is dividable. Great visibility from traffic visiting our new Fitness tenant: CHUZE Fitness and neighbors.